Official Turkish statistics admitted only one principle of discrimination between the ethnic groups dwelling in Macedonia, namely religion. Thus all the Mahomrnedans formed a single group although there might be among them Turks, Albanians, Bulgarian "pomaks," etc. : all the patriarchists in the same way were grouped together as "Greeks," although there might be among them Servians, Wallachians, Bulgarians, etc. Only in the "exarchist" group, did religion coincide, more or less, with Bulgarian nationality. Since the Bulgarian idea, as it is well known to all, is deeply rooted in Macedonia, I think it is almost impossible to shake it completely by opposing it merely with the Serbian idea. This idea, we fear, would be incapable, as opposition pure and simple, of suppressing the Bulgarian idea. That is why the Serbian idea will need an ally that could stand in direct opposition to the Bulgarianism and would contain in itself the elements which could attract the people and their feelings and thus sever them from Bulgarianism. This ally I see in the Macedonism or to a certain extent in our nursing the Macedonian dialect and Macedonian separatism. ]Modern Slavs, both Bulgarians and Macedonians, cannot establish a link with antiquity, as the Slavs entered the Balkans centuries after the demise of the ancient Macedonian kingdom. Only the most radical Slavic factions—mostly émigrés in the United States, Canada, and Australia—even attempt to establish a connection to antiquity [...] The twentieth-century development of a Macedonian ethnicity, and its recent evolution into independent statehood following the collapse of the Yugoslav state in 1991, has followed a rocky road. In order to survive the vicissitudes of Balkan history and politics, the Macedonians, who have had no history, need one. They reside in a territory once part of a famous ancient kingdom, which has borne the Macedonian name as a region ever since and was called ”Macedonia” for nearly half a century as part of Yugoslavia. And they speak a language now recognized by most linguists outside Bulgaria, Serbia, and Greece as a south Slavic language separate from Slovenian, Serbo-Croatian, and Bulgarian. Their own so-called Macedonian ethnicity had evolved for more than a century, and thus it seemed natural and appropriate for them to call the new nation “Macedonia” and to attempt to provide some cultural references to bolster ethnic survival. Italian linguist Vittore Pisani stated "the Macedonian language is actually an artifact produced for primarily political reasons"
To this end he spent much time in Macedonia. ‘Macedonia,’ be it observed, is a conveniently elastic term, which is made to include all the territory anyone wishes to annex. It is a loose, and therefore misleading term. 10. 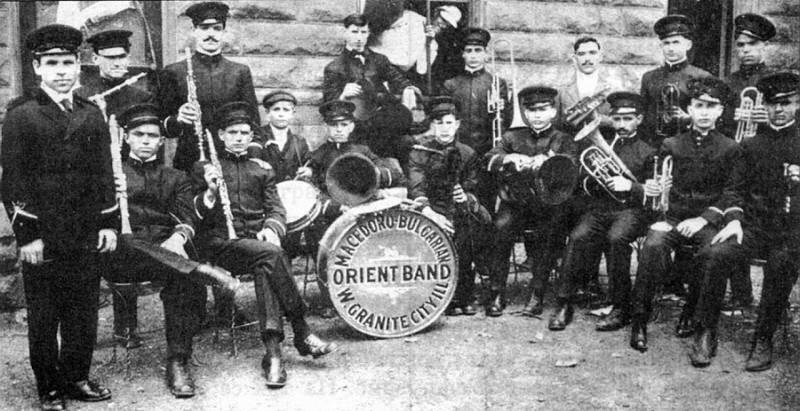 "Bulgarian Balkan Band" - founded in 1915 in Stilton, Pennsylvania. Most of its members were from Prilep, Macedonia. Jo vetem "maqedonasit", por dhe serbet jane te prejardhur gjuhesisht nga bullgaret, gjuha e tyre eshte thjesht nje zhvillimi lokal i Church Sllavonic(Bullgarishtja e hershme). Edhe nga origjina Shqiptare jane te perbere keta Sllavet e Maqedonise , kurse Vllehet nuk i cek askush ketu . Shqiptaret Orthodox quhen sot Sllave qe ne i njohim akoma ato fshatra ku banonin (banojne) . Nuk eshte kohe e gjate per ti harruar , pasi jane edhe dokumentet . "Shkencëtarët nga Evropa që ndjekin flirtin me Maqedoninë e lashtë shohim atë në drejtim qesharak dhe me keqardhje "
thotë Ulf Brunbauer, historian gjerman. Per gazeten Sllavo Maqedonase"UTRINSKI", Ulf Brunnbauer flet per fallsifikimet qesharake qe i ben shteti dhe historianet Sllave , njekohesishte i cek edhe shqiptaret duke tentuar Sllavet e maqedonise me argumente genjeshtare dhe qesharake me te vetmin qellim per t'ia mohuar autoktonin shqiptareve . Historiani Gjerman ne kete interviste gjithashtu argumenton qe Sllavo Maqedonasit jane Bullgar ! Zeus10 wrote: Jo vetem "maqedonasit", por dhe serbet jane te prejardhur gjuhesisht nga bullgaret, gjuha e tyre eshte thjesht nje zhvillimi lokal i Church Sllavonic(Bullgarishtja e hershme).